• Share your photos and observations with scientists and an ever growing community of amateur fishwatchers. • Discover species, their habitat and way of life thanks to the photos and informations uploaded by other nature lovers. Devised and managed by the French scientific association Peau-Bleue and the research laboratory ECOMERS (Nice – Sophia Antipolis University), the Fish Watch Forum aims at collecting and gathering your records and observations of Western Europe and Mediterranean marine fish. 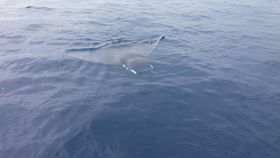 The Fish Watch Forum works thanks to the team of volunteers in charge of validating the data and putting them online... Please be indulgent, and send us any useful remark (see the "Contact" thumb on top of this page). Use our photo database to find and name it! All our search tools are on the left menu. You wish to identify a fish? • Use our Identification tool to find the most probable families. You want to explore our photo database? • The search by name will help you find a species or fish group with its common or scientific name (type a few letters and select from the list that appears). • With the multi-criteria search, select fish groups, regions or habitats. • You can also search directly among scientific names in the Taxonomy section. Share the information with the community! The Fish Watch Forum deals with Europe and Mediterranean marine fish. Wether you are a scuba-diver or a spear-fisher, an amateur or professional fisherman, a tide pooler or a beach comber, your photos can be useful for marine biologists and amateur fish lovers alike! • Click on the Submission form on the upper bar, and follow our intuitive procedure. If you see me, send us a record! 11-14 January 2019: visit us! The Fish Watch Forum will be at the Paris International Dive Show! Tell your friends to join us at our stand Sentinelles de la mer Occitanie (M 02 - N 01). And tell them to bring their interesting European fish photos in a USB flash memory : our volunteers will help them upload their records to the Fish Watch Forum. See here. 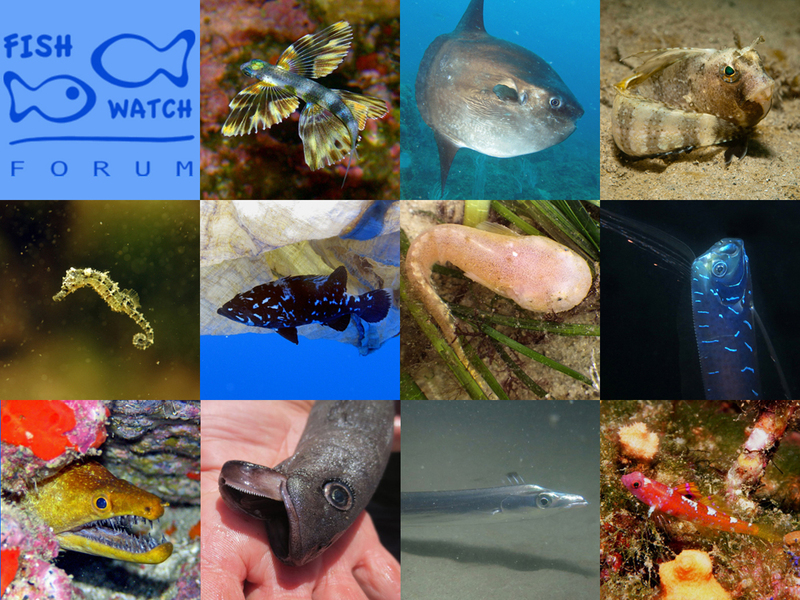 You would like to know what has been achieved by the Fish Watch Forum since its beginning? 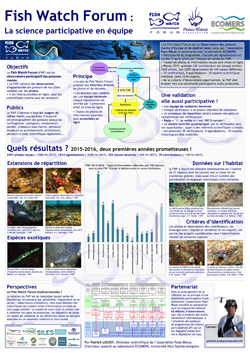 Have a look at our 2017 poster (3.2 MB, in French, sorry! ).